OSWEGO – Open house at Fitzhugh Park Elementary School brought students, their families, teachers and other supporters together to synergize about the 2018-19 school year. 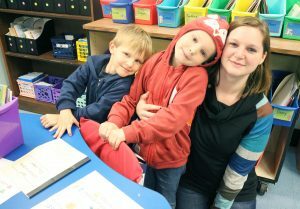 First grader Riley Webster, center, shows his mother, Victoria Walters, and little brother, /FPS UPK student Koda Webster,his booking and writing progress during the school’s open house event. A crowd gathered in the gymnasium, where students and their guests were greeted by Principal Donna Simmons. A focus of the school year, she said, is for staff members to guide students along with the advancement of their academic skills and practice mindfulness to help share strategies to increase s student’s abilities to focus. After other school highlights were shared by fourth grade teacher Nick Little and Home and School Association representative Shelly Sloan, students and their families dispersed to their respective classrooms. Parents and guardians who visited Marlena Shortslef’s first grade classroom completed a scavenger hunt as they toured various parts of the classroom and ended at the student mailboxes where there were special treats inside. Families also received opportunities to visit special areas and the book fair.